Forgotten Memories. Dark Enchantments.And a Long-Lost Source of Unimaginable Power. Keeping her end of a desperate bargain to save her island home from destruction, Alexa Costa finds herself in the unlikely employ of Queen Jada. Bound by a powerful spell, she swears allegiance to the kingdom of Alvair and remembers nothing of her romance with Caleb. Now she must adjust to life within the castle, where her personal opinion means nothing, her skills are constantly put to the test, and her private thoughts are public knowledge. Rumors abound and secrecy reigns in Queen Jada’s inner circle, the members of which include the mysterious Prince Dante, the self-obsessed Princess Tiana, and the valiant Captain Whitman of the Alvairan Army. It’s only a matter of time until Alexa suspects treachery, but with enemies waiting outside—and inside—the castle walls, will regaining her memory be enough? **Sent a copy from the author in exchange for an honest review.**OMG! 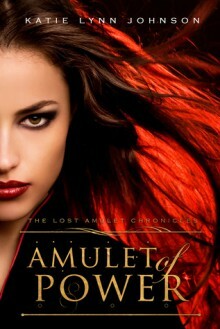 The Amulet of Power is an outstanding sequel to the Amulet of Elusion next. Especially after reading that sneak peek!If you're looking for a good fantasy with action and romance definitely check out this trilogy!